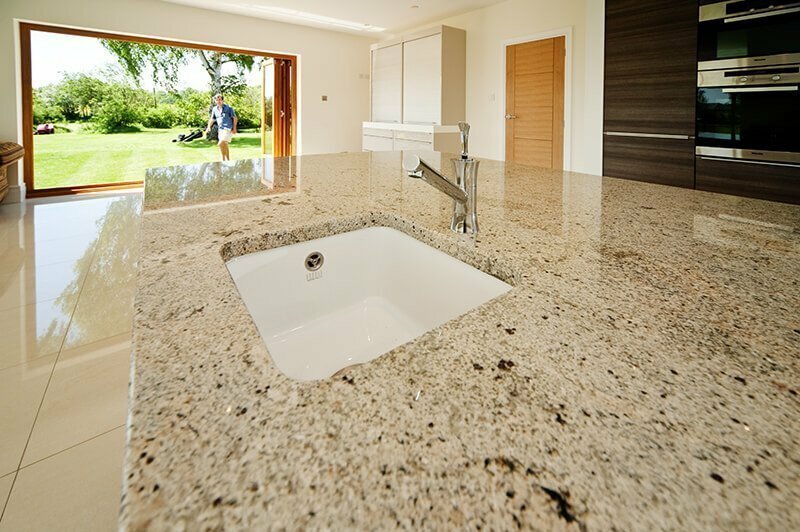 Undermounted sinks are fitted below the worktop, with a polished hole cut in the stone forming the “entry” to your sink. Tapholes must be cut into the stone, and many people also have drainage grooves ground and polished into the top surface. 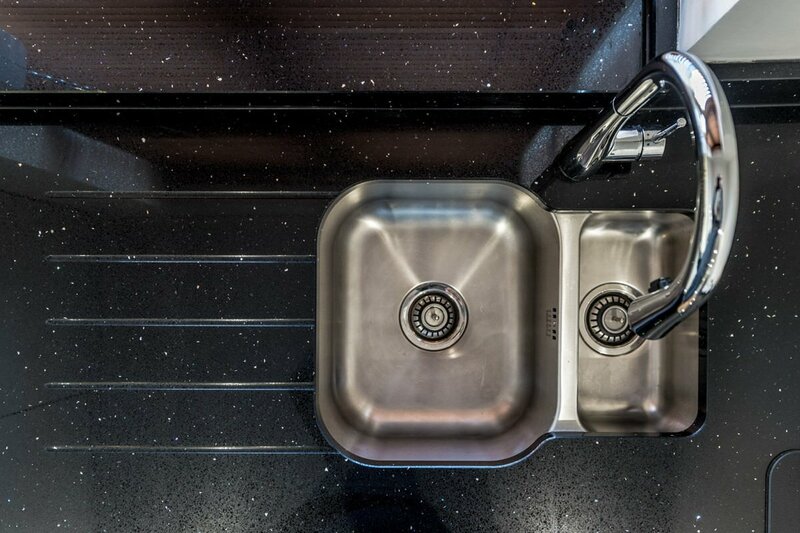 Topmounted sinks sit on top of the worktop, with a flange or lip sealed down onto the stone. Because the hole through the stone is not visible, it doesn’t need to be polished. Tapholes are normally in the “tray” of the sink itself and do not need separate cuts in the stone. the drainage area is integral to the sink and cannot be cut into the stone. 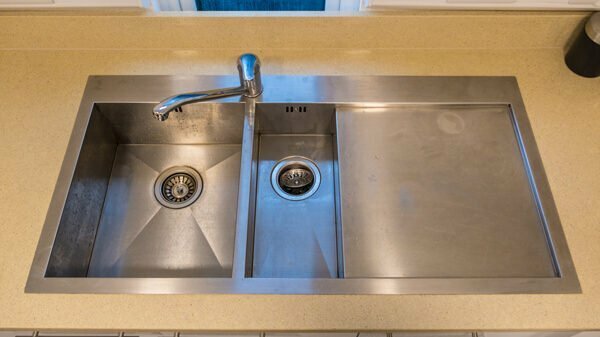 Rolltop sinks may look superficially like topmounted sinks, but have no cutout in the worktop at all, as the sink tray runs right from front to back, fully replacing the worktop. 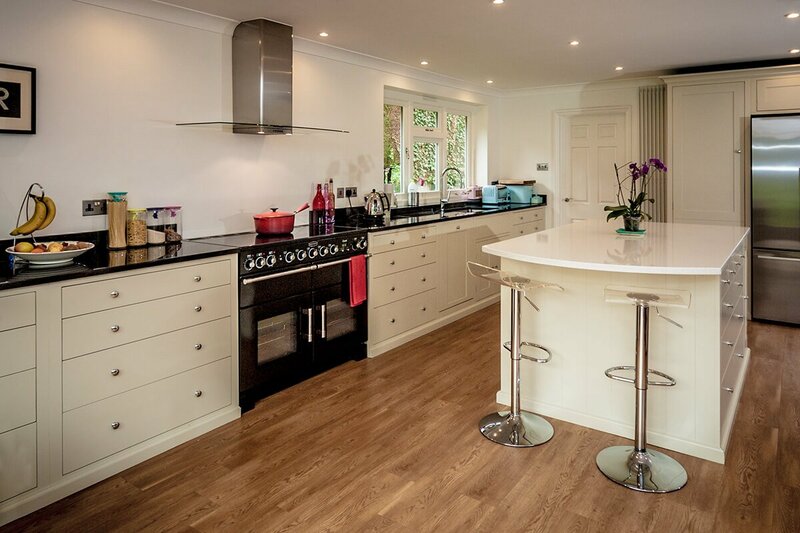 They are supported by the kitchen units, although there may also be a flange overlapping the worktop to the sides. A relatively uncommon type, they offer maximum surface area for work and drainage, handle water really well and avoid the “puddling strip” which can occur along the back of a topmounted sink. Butler sinks generally sit below the worktop, but come right to the front of the worktop, having what is called an “apron front”. They have a three sided polished cutout. Because the strip of stone at the back is relatively thin and weak compared to the size of the cutout, they are often installed using a separate strip of stone at the back. More definitions (including of other sink types) can be seen in our glossary, here. A regular question we hear is which of these basic types is better. There is no one right answer; issues of taste and lifestyle will make customers lean more one way or another. See below regarding drainage issues, where undermounts may lose out marginally. However, aesthetic factors tend to dominate, especially where most washing up is done in the dishwasher. In the ongoing battle between undermount and topmount types, it needs to be said that sit-on sinks probably win in terms of absolute practicality when it comes to water handling- a drainer attached to a sit on sink will drain better than the grooves that are cut into the granite work-surface to go with an under-mounted sink. To be absolutely blunt, drainage grooves cut into polished stone at 30mm thick or less cannot slope enough to really drain. They are aesthetically pleasing – they look right! – and they stop hot glasses full of expanding air hovercrafting off the edge of the worktop, but they are not great drainers. With an undermount sink, the hole into the sink is the hole in the worktop. The edges must therefore be polished and thus the hole is referred to as a polished cutout. 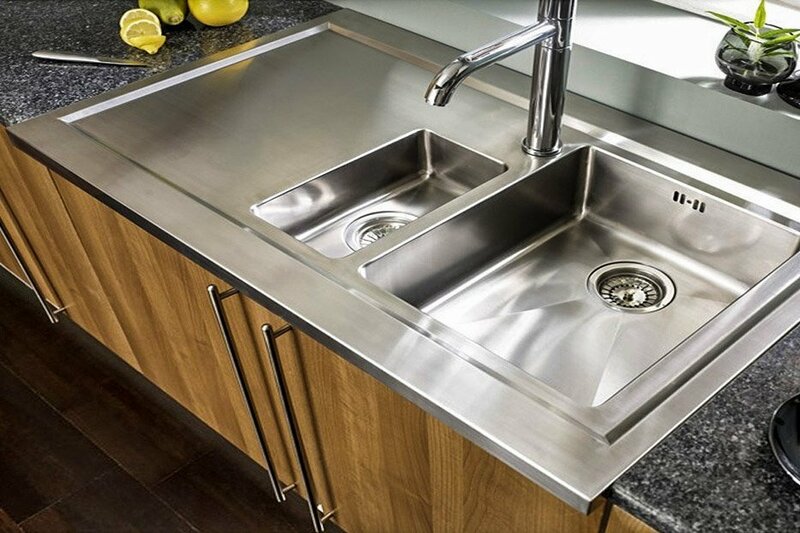 Single bowl topmount sink in stainless steel. 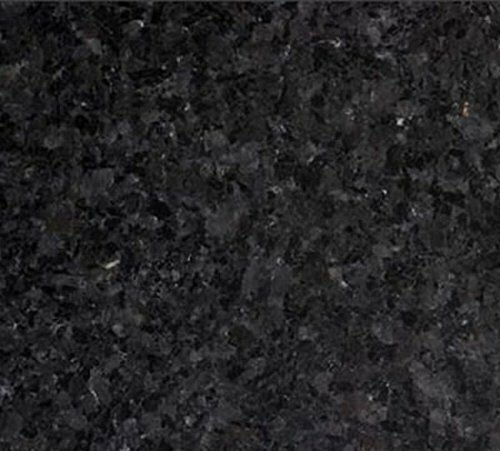 Dark grey 20mm quartz. Cast iron one-and-a-half bowl topmount sink in stainless steel. Dark grey 30mm quartz. Very square style double topmount sink in stainless steel. Dark grey 20mm quartz. We feel that topmounted sinks come into their own where a significant amount of washing up is done the traditional way. Where water-handling is paramount, that old fashioned topmounted tray helps catch it and direct it to the drain. 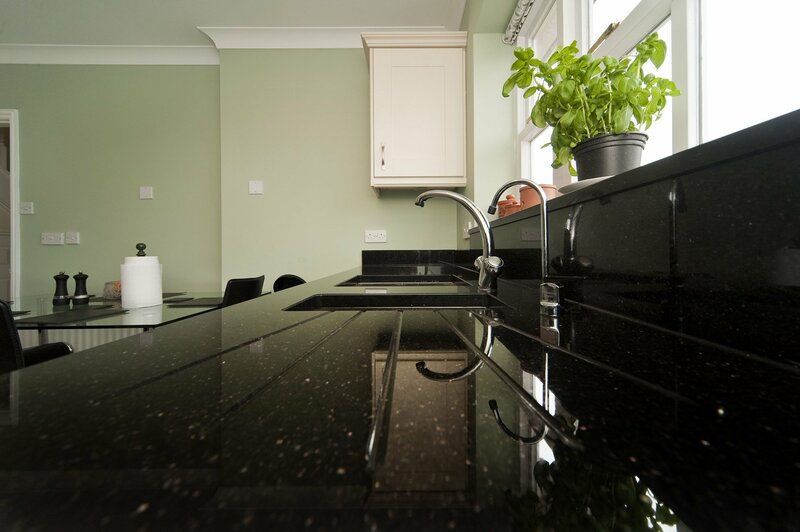 Conversely, keeping the strip to the back clean and dry can be a pain, although this is not as critical with stone worksurfaces as it is with wood or laminate. And, after all the practicalities have been considered, some people just like the look of the topmounted sink. With a topmounted sink, the hole into the sink is the sink itself – you can’t see the cutout in in the worktop. The edges don’t have to be polished, and so the hole for the sink is referred to as an unpolished cutout. Double Butler. Steel Grey Granite. Single Butler. Baltic Brown Granite. Double Butler. Slip at rear. Nero Angola Granite. Double Butler. Multiple tap holes. White Quartz. Belfast, Butler and Farmhouse are sink types, often very large, which come right to the front of the worktop. They only have stone on three sides at the most. The majority of these sinks are ceramic, but stainless steel is also used. 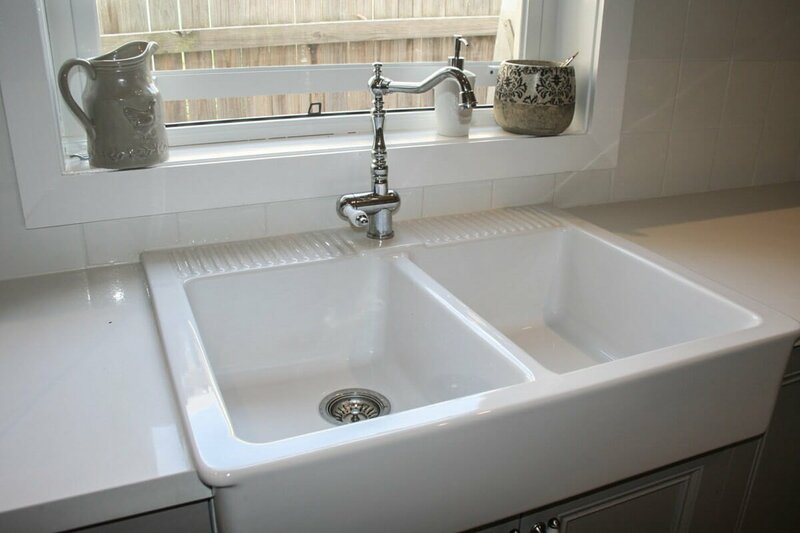 These sinks come and go a little in popularity, but always form a significant proportion of our overall installations, especially in traditional type kitchens. Because of that large white area at the front, these sinks (and their installation type) are also often referred to as apron-fronted. Belfast sinks are Butler sinks that have a weir-type over flow. They get the name from a period when constant running water was a feature of life in Ireland – while London had to conserve water, Belfast could afford to waste it! Farmhouse sinks are double-Belfast or double-butler sinks. Traditional Butler sinks sit beneath the worktop, so the three sided hole must be polished, just like the polished cutout for an undermount sink. 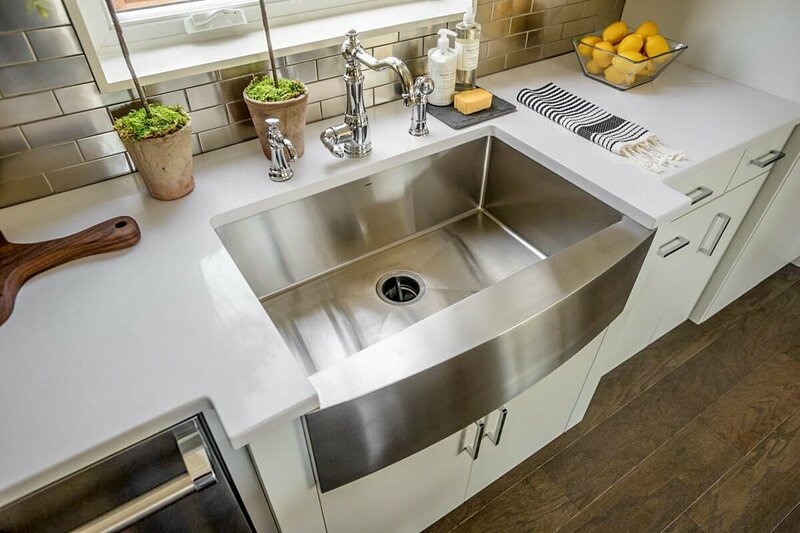 Depending on the breadth of the strip at the back, the strength of the worktop material chosen and the weight/length of the sections to either side of the sink, it may or may not be feasible to make the sink run in one piece. Often it is advantageous, or even simply essential, to have a separate strip at the back, with two small joins. We have installed hundreds of Butler sink layouts, by both methods. Single Butler showing curved corners for a one piece cut out. Double Butler with square, joined corners at back strip, due to overall run length. Some Belfast/Butler sinks have a flange that sits on top of the worktop. They are thus effectively top-mounted. In most, if not all cases, this type of Butler sink extends right back to the wall, with a built-in section at the back for the tap. As a result, no cutout is required at all – the sink simply replaces its own breadth of worktop, like a roll-top. Examples would be the Domsjö sinks from Ikea or the Astracast Canterbury. The Domsjö especially is a great sink for people wanting a relatively shallow bowl. 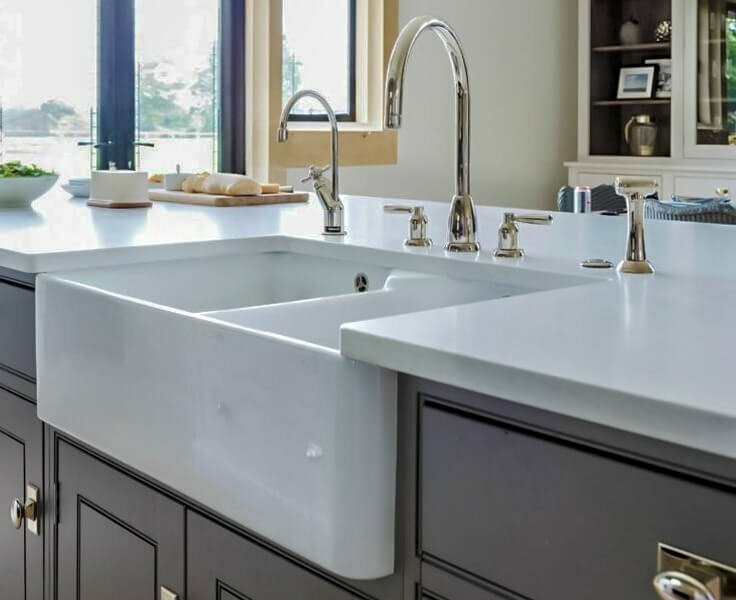 Among all the sink types available, the beauty of big butler and farmhouse sinks is the traditional look and loads of space – a washing up bowl in the sinks still leaves ample room for slops or rinsing. 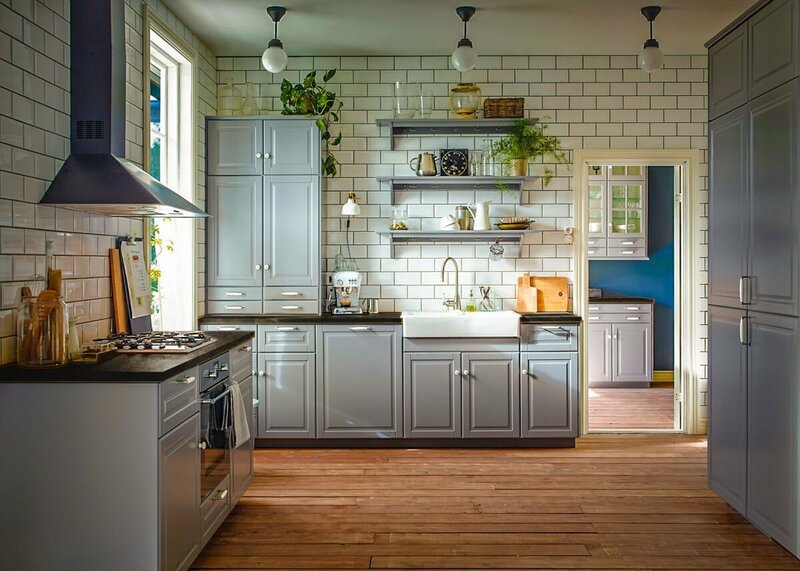 Double Ikea Dromsjo teams with black worktops on classic grey units. 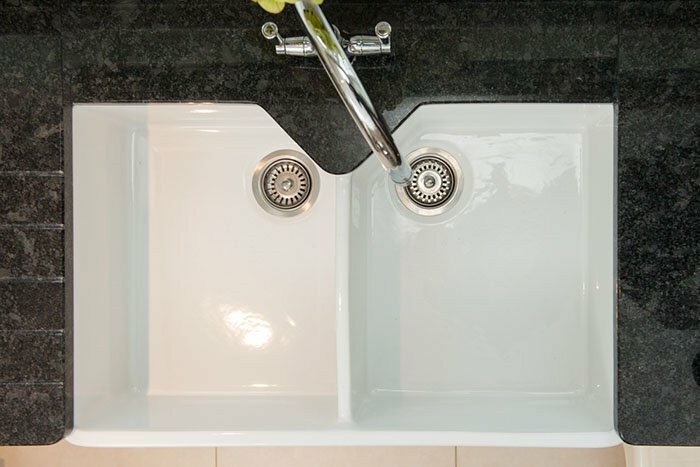 Dual-use, under- and top-mounted sinks. 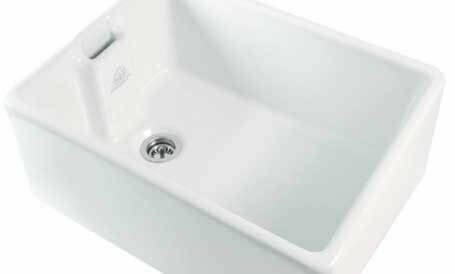 Some sink manufacturers sell sinks that are described as being suitable for either under- or top-mount use. These are generally not the ideal choice as they often have a deeper flange that is not as aesthetically pleasing when fitted, and often leave little room for the tap hole. We would also NOT recommend stainless steel under-mounted sinks which have a tap-hole cut into the sink (i.e. where the tap is attached directly to the sink and does not require a hole cut into the granite). 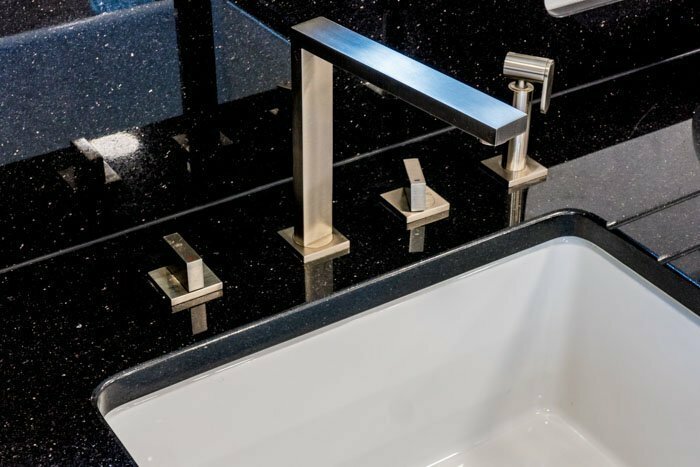 If you have any concerns about your sink, please contact our sales team to discuss its individual suitability for your particular installation.